Phil Mickelson was embroiled in controversy over his use of a wedge club made legal only by a rule loophole. 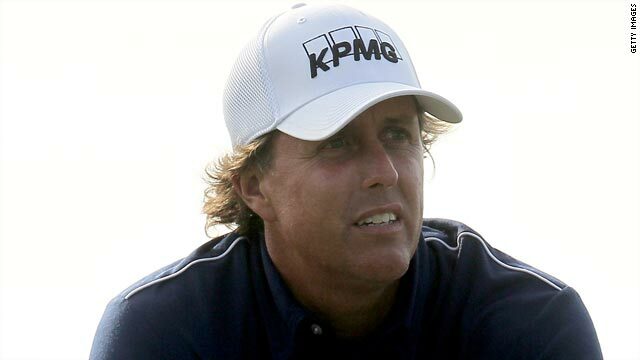 (CNN) -- Phil Mickelson is hoping to bounce back from a controversial and disappointing start to his 2010 season with a record third successive title at the Northern Trust Open in Los Angeles this week. The world No. 2, golf's greatest hope in the absence of the disgraced Tiger Woods, finished 19th at the Farmers Insurance Open at Torrey Pines after a closing round of one-over-par 73 on Sunday. His four-round total of 280 left him five strokes behind winner Ben Crane, who triumphed by one shot for his first victory since the U.S. Bank Championship in Milwaukee in 2005. The American's performance in San Diego was overshadowed after he was accused of cheating by fellow player Scott McCarron for his use of a wedge club that features non-conforming square grooves. Mickelson was able to use the club, made by Ping, because it was manufactured before 1990 and thus falls inside a rules loophole. He was in fifth place ahead of the final round, four shots behind 54-hole leader Ryuji Imada of Japan, but was unable to maintain his progress. "I got off to a terrible start, and then throughout the round didn't get much out of it. But the good thing is that I've got a direction of what I'm working on," Mickelson told reporters. "I felt like I hit some good shots coming down the stretch. The last 13, 14 holes I actually hit a lot of good shots. I'm excited about next week because my game is feeling not as rusty as it looks, and I've had some success up at LA. "I'm excited to be back playing golf. I missed being out and playing competitively. I've had 10 weeks off, and I'm excited about getting the year started again. "I love starting in San Diego. It's one of my favorite tournaments, and I felt like I was ready. I didn't get the performance I wanted, but next week in LA, I think that I should be able to get it turned around." Fellow American Crane was delighted to secure his third victory on the PGA Tour, especially after having been misquoted by a magazine in a statement about Woods' marital indiscretions. "Obviously being in the news a month ago was bizarre," the 33-year-old said. "Someone made some stuff up that I said something about Tiger, which I didn't. "Now to be in the news again, obviously my name keeps popping up, it's obviously good to be on a good note." Australians Michael Sim (71) and Marc Leishman (68) tied for second on 276 with American Brandt Snedeker (69), while former world No. 1 Ernie Els (69) was another shot back along with U.S. players Michael Allen (65), Rickie Fowler (70) and Alex Prugh (66). The first round of the Northern Trust Open tees off at the Riviera Country Club on Thursday, with Mickelson seeking to become the first player to win it three years in a row since its inception in 1926.